are a perishable commodity- every unoccupied room is revenue that cannot be made back. Even with enough reservations to fill a hotel, there are always last-minute cancellations or no-shows. Because of this it’s common practice for hotels to purposefully oversell on busy nights. Of course this may prove to be risky if everyone shows up, but perfecting the art of overbooking can be profitable. It’s important for a hotelier or revenue manager to know their average cancellation and no-show rate if they are going to purposefully oversell their property. This can help to better gauge the likelihood of actually being sold out. If a hotel takes a deposit to guarantee the first night’s room and tax it’s possible to run over 100% occupancy for a night. Most modern property management systems allow for “mock” inventory. These rooms are incredibly useful for optimizing a hotel’s actual inventory. Prior to running the nightly audit, any guaranteed reservations that haven’t arrived should be moved into these rooms and be included in the audit. Alternatively, auditors can manually post room and tax if this feature isn’t found on their PMS. 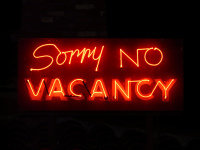 It is important to note that if a hotel is going to purposefully oversell, they need to have very clearly written cancellation and no-show policies on their website and ideally have them included with their confirmations emails. Unfortunately, overselling isn’t always planned. Unexpected stay overs or emergency maintenance issues and clerical errors can quickly drop a hotel’s inventory into the negative. In these situations hotels will need to “walk their guests” and find new accommodations for them. This is never ideal since this means giving business to your competition, but the unforeseen can happen to them as well so a working relationship between neighboring properties is always beneficial. Hoteliers should try to work out a walk rate with other hotels before actually needing them. Setting this up in advance can help to avoid being gouged when the rooms are needed. Since this isn’t a perfect system, a new company is stepping in to try to help. HotelOverbooking is still in their start-up phase, but is developing an extranet for oversold hotels to list their guaranteed reservations on. This can not only help hotels looking to find a room for their displaced guests, but it can help bring extra revenue into hotels looking to sell out. Once their service is up and running this site could be a new tool every hotelier needs at their disposal.